During the winter season, you’ll likely be spending a lot of time inside your home. While some people get restless indoors, others are motivated to use the time to improve their homes. Being stuck inside your home in cold weather is a great time to complete household projects. There plenty of indoor tasks you can do as winter home improvement projects. Remaining inside of your home during the winter may inspire you to change the color of your walls. Since winter days are shorter, choosing a bright and cheerful color scheme for your rooms will lighten the mood in your home. 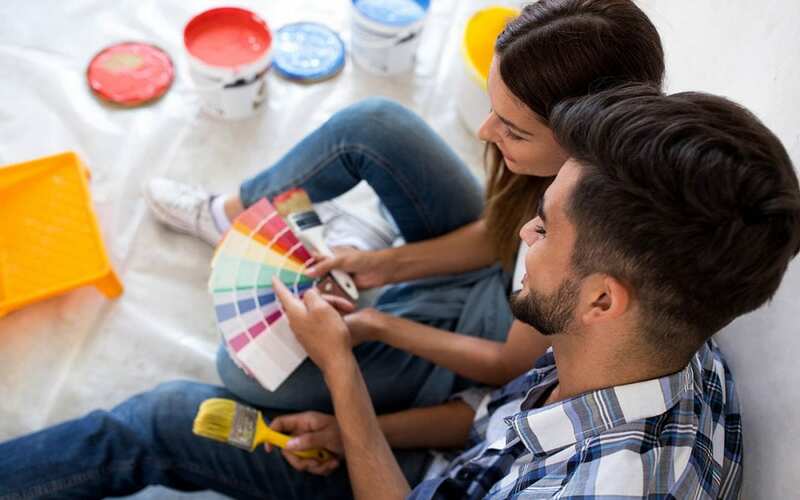 Painting your interior walls is one of those winter home improvement projects that can make being stuck inside of your home fun and productive. We’re all guilty of tossing random articles of clothing and items into the nearest closet. While the idea is to go back and organize the closet later, it rarely happens in a timely manner. This winter, use some of the time you are stuck indoors to organize your closets. With freezing temperatures and cold winds outside, you will be glad to have a task that keeps you busy for hours indoors. Closet organization is one of those winter home improvement projects that can seem like a daunting task, so it’s best to have a strategy. Something to keep in mind is that every item you keep should have a specific place it belongs. Tackle your closets one at a time and throw away or donate as much as you can. Organizing your home goes hand in hand with getting rid of things. Your house can become cluttered over time by stashing away useless or broken items thinking that they’ll be useful at some point in the future. Use this coming winter season to rid your home of items you don’t need. Winter home improvement projects that require purging and decluttering can take a while, so it’s best to focus on one room at a time. Rearranging furniture as one of your winter home improvement projects is a great way to freshen up your space. There’s a lot that can be accomplished by simply moving the furniture around in your living room or bedroom. It can make the room feel brand new, which can brighten your mood during winter. Winter is the perfect time to make upgrades to your bathroom. Several small upgrades like installing a low-flow showerhead and faucet and replacing cabinet pulls can make a big difference. If you want to take on a bigger project, you could re-tile the shower or floor. Hiring professional contractors to complete bathroom remodels is a better option if you don’t have DIY experience. Diligent Home Inspections offers home inspection services to Central Maryland. Contact us to schedule an appointment.